Senior guard Bri Cummings drives past a South Dakota State defender during a women's basketball game in November. After Wednesday night’s women’s basketball game against Mercer, head coach Jennifer Rizzotti was unable to think of one thing her team did well. The Colonials (3-6) started off the game trailing 16–0 in the opening eight minutes and they never brought the difference back under 10 points as the Bears (7-2) pulled off a 61–44 victory at home. GW shot its lowest percentage from the field and the three-point line on the year at 26.3 and 22.2, respectively. 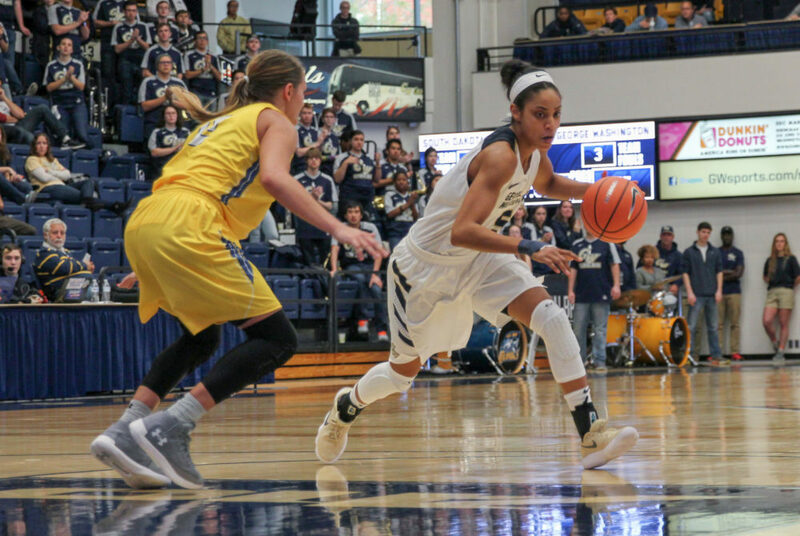 In her time at GW, Rizzotti’s teams have averaged 66.1 points and have never scored less than 48 points until Wednesday. The Colonials were without its top scorer, senior forward Kelli Prange, for the second straight game because she experienced concussion symptoms. In her absence, senior guard Brianna Cummings was the only member of the roster to finish with more than eight points to her name. Although Cummings finished with 15 points and a double-double, she started the game playing below her standard and finished the night shooting just 5-for-18 from the floor. The Bears defense held GW to just five points in two separate quarters and did not allow the Colonials to capitalize on their 13 offensive boards. After GW fell behind in the first quarter due to poor shooting, junior forward Kelsi Mahoney scored the team’s only two baskets of the frame. The Colonials trailed 22–5 after the opening 10 minutes of the contest. Already at a disadvantage, GW’s defense stepped up in the second frame and did not allow Mercer to score any points for the opening four minutes of the quarter. Still, the Colonials were outscored 13-12 in the second 10-minute chunk and looked out of contention at the halfway mark. The Bears essentially iced their victory with a 15-0 run in the opening eight minutes of the second half. They led by as many as 33 points in the third quarter and Cummings scored GW’s only five points of the frame over a two-minute stretch. In the fourth quarter, both sides played their benches and GW outscored Mercer 22-11, but it was too late to alter the outcome. The Colonials return to action Friday in College Park, Md. where they go up against No. 15 ranked Maryland (8-2) at 7 p.m.